Rafael Lozano-Hemmer - Project "Pulse Phone"
Pulse Phone is an application that measures your heart rate by using the iPhone's built-in camera and flash. 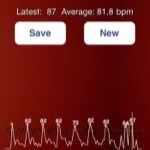 The application detects small variations in the opacity of your finger as blood flows through it and calculates your pulse in beats per minute (bpm) using this information. The app visualizes the data graphically and can store it for later reference. To use, go to the "Live" tab and place your index finger over the camera. After a few seconds your pulse will be detected and an animation of the data displayed. You may save recordings and email them to yourself in the "History" tab. The app was originally programmed in March 2009 for the first iPhone, but was rejected as we hacked illegal Apple camera frameworks. Since then, Apple has relaxed the restrictions on camera access to developers and so this is an official, tested and legal release. 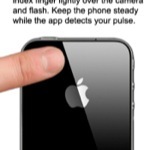 The software runs best on iPhone 4, as it uses the built-in flash to illuminate the finger. If your device does not have a flash then you will need to hold up the phone to a bright light to get acceptable results. I have a few questions about the app, though. Most simply, what's your goal for it? Just for people to visualize their own heart rates? To take the results to the doctor? To eventually integrate into an art installation? (Like a remotely accessed Pulse Park?) A programming/biometrics experiment? The app is for now a one trick device. 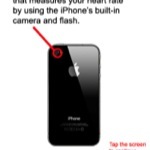 It quickly and accurately tells you your pulse using the camera as a sensor. We see it as a useful tool for people who exercise and potentially as an aid to monitor certain medical conditions, although of course we do not claim this is a replacement for a professional pulsimeter. The project is part of the ongoing series of projects that I have made with biometrics (click here to see them). Though the artistic side for now is only the visualization of the data that the sensor gathers. You are completely correct that eventually we will use this interface for future city-sized pulse projects, though that will happen in another app. For us, "Pulse Phone" is like a spin off from research we had to undertake for instance for "Pulse Tank". Also, how is the information exported when you email it? 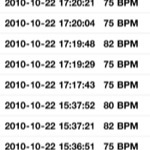 It is a just a text list, with a date and time stamp and the heart rate in BPM. If people get the app we will expand that to optionally also include GPS coordinates (for runners/cyclists/etc), export in variety of formats and graphing data sets. I see you're using a 3G phone in the video, but read on iTunes that the app works better with the iPhone 4 flash. Can I get similar results with the older iPhone, or do you have to position your finger differently? With the old iPhone and with the iPhone Touch you need to provide your own light. So you put your finger on the camera and then point that to a well illuminated space and hold your hand still. The nice thing about the flash is that it is so bright that you can easily use the app in complete darkness, and the results are also pretty immune to you moving your hand around while the pulse is being detected. (Incidentally, as the app turns on the flash when it is live, the phone can become a handy flashlight). 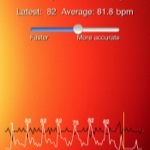 Are there other apps that measure your heart beat? what advantages does your app have? Yes, there are four approaches: use dedicated hardware, find and tap your pulse manually on the screen, use the built-in microphone and use the camera. Our advantages are that the system works in noisy environments (like gyms), it works in the dark if you have a flash on your device, it allows you to set a sensitivity level, our image analysis is very sturdy so you get quick and accurate results and our price is low. Is the iPhone camera capable of differentiating different wavelengths of light, as with spectroscopic devices? Or does it rely only on changes in brightness/color? The iPhone camera totally CAN differentiate between different wavelengths of light so you could potentially use it to detect oxygen levels. The problem is with the light sources...ideally oximeters use a couple of light sources (I think one of them is infrared) and obviously those don't come with the iphone. It would not be hard to add a hardware "clip" to provide the right light and shield the camera from external light interference, but unless we can get some money to develop that, it is out of our schedule as we have to make some art! ;-) So yes, we are using our own algorithm to extract the pulse based on changes of brightness and color. Keywords: indoor, database, biometric, recorder, tracker, outdoor.